No need to meal prep, or buy pre-mixed muesli, mix up your own in five minutes, and for just 81p. Add your oats, seeds, fruit and nuts to a bowl with the cinnamon and mix together. Pour over your milk and top with the berries, and enjoy! In an ideal world, we would be preparing our muesli in bulk ahead of time, jarring it up ready to dish out in the morning for breakfast. However, as a student, or someone working full-time with a busy schedule, this kind of meal-prep doesn't always happen. 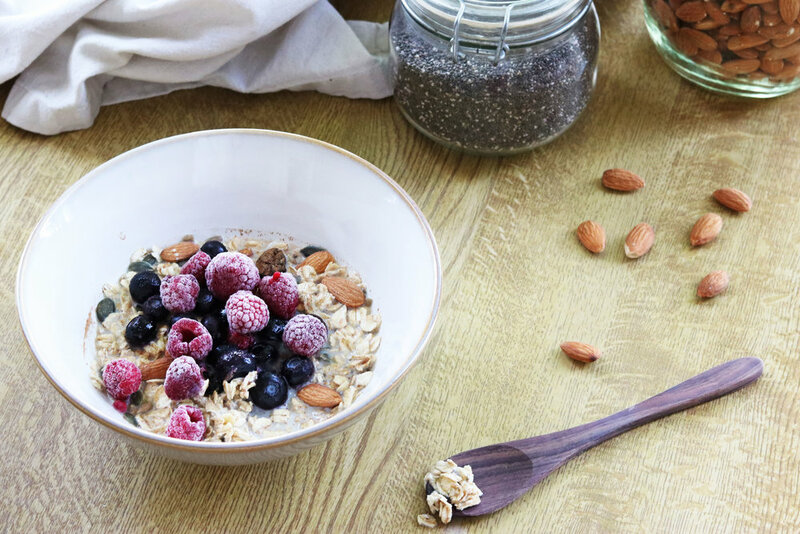 Therefore this five-minute muesli is ideal for when you just haven't been very organised! Use whatever nuts, fruit and seeds you have in your pantry. I know they seem like expensive ingredients initially, but they can be used in endless yummy recipes. ready to start creating? make it. get started with squarespace.